his delightful two bedroom modern villa is located on a quiet residential street in the popular, traditional village of Konia. ​Only a few minutes’ commute from Paphos Town and the coast, Konia is well known for it’s prestigious properties and convenient location. For those keen on golf, there are four excellent golf courses within a 10 to 15 minute drive. The property is very well presented with good quality finishes throughout. It comes fully furnished and there are title deeds. To the front is a gated driveway with plenty of parking space and a wooden storage shed, nicely tucked away in one corner. The ground floor includes a comfortable lounge with feature fireplace, fully fitted family size kitchen/diner and inner hallway with guest toilet, useful under stairs storage cupboard and marble staircase leading up to the first floor. Upstairs is a spacious landing with study area and sliding patio doors open out to a good size covered veranda from where you can enjoy beautiful coastal views. The master bedroom with dual aspect windows features an en-suite bathroom and separate walk-in closet. Bedroom two has fitted wardrobes located to the side and an en-suite shower room. Externally, the wonderful, fully enclosed L-shaped outdoor leisure space has been designed with low maintenance in mind. At one end is a covered dining/entertaining area and centrally, a decked area provides a further relaxation space. Below the decked area is a swimming pool currently not in use and with the addition of the necessary pool and pump equipment, there is the option to make this fully operational. 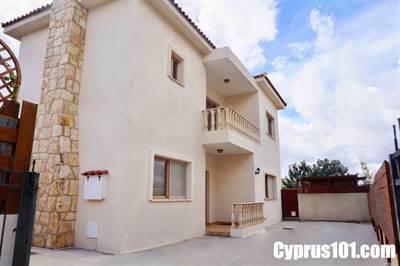 The property is ideal as a permanent residence or holiday home and for those looking for a quiet residential village setting, close to all the amenities and beaches of Paphos, this property has lots to offer.